Moonlight Mandalas | Just as the light of the moon breaks through the darkness, Mandalas help us bring to light the buried aspects of ourselves. I love when trees show up in my mandalas. Trees are a potent symbol of life. Their roots go deep into the earth, grounding the tree in its nutrients. Their branches reach up into the sky, free to move and dance with the winds. Their trunk is the strong core, standing steady and connecting the heavens and the earth. My Strength Tree mandala is made in honor of the many, many people in my arthritis family. They are the strongest people I know and they inspire me every day. Living with chronic pain and physical limitations, day in and day out is a tough journey. Most people can’t see the struggles they endure every day. They are warriors who get up and put on a happy face even when they are in deep pain. The Strength Tree is inspired by the thought that we (my arthritis friends and I) are all super strong at our core (our tree trunk) despite our physical & emotional pain, loss of mobility and body/joint changes (the gnarled roots and twisted branches). We can look at the Strength Tree and see that the crooked trunk and twisted branches do not take away from its beauty. It can still provide shelter, shade, nourishing fruit, beautiful leaves, and a strong rootedness in the earth. We can water it with our tears on bad days and sit under it in gratitude on our good days. It is tower of strength and life and I dedicate it to my arthritis family as a reminder of their incredible strength. Life throws us many ups and downs and curve balls. That is just how life is. The privilege of being here on earth in a body is that we get to experience the full spectrum of good, bad, and ugly life events. How we respond to those events is what determines how well we move forward and live fully. Have you ever felt like you were carrying around the pain of past hurts? Like a big rock strapped to your back, the weight of the hurts are constantly bogging you down. It is very common for us to carry around these old emotional pains. Someone hurt us by actions or words; someone betrayed us; someone dumped us; someone didn’t love us. Letting go of the hurt/wound sounds easy to do. In reality, it is not so easy to truly let go and surrender them up. It is worth it to pay attention to what old hurt is weighing us down and to how it is expressing itself in our lives. Do we get stuck in anger or resentment or sadness or depression? Do we withdraw from life? Do we play the scene or conversation over and over in our minds? Do we have thoughts of getting back at the person who hurt us? Do we take on the role of victim and give away our power to who hurt us? Do we get stuck in thoughts of the past and not enjoy the present moment? Learning to let go is a process. Sometimes we want an apology from the other person. Most often, an apology never comes and we are left on our own to heal the hurt and find a way to let go/ release/ forgive. The conscious choice to let go is the first step. Realizing that holding on to the hurt is wounding ourselves even more, helps us make that choice to let it go. There is no judgment for how long you hold onto the hurt, to carry the weight of the pain. Each person will decide for themselves how long they are willing to hold onto the anger, resentment, sadness, or depression before they offer it up for surrender to let go. Here is a great article for 5 ways to let go of past hurts. For myself, I have been battling a lot of anger for the past couple years. Most people are surprised by that since I am so mellow and easy-going and get along with nearly all people. Some of the anger is very old anger and some of it is more current, day-to-day anger. I don’t like carrying around this anger, but I am not good at expressing it in a constructive way. One of my intentions this year is to work on releasing my anger and healing. Turning to art and journaling are my best ways to express what is bottled up inside and weighing my spirit down. For this mandala, I asked myself what would it look like to let go/ release/ forgive. After meditating on it, I saw myself blowing a dandelion and visualizing all my anger, sadness, resentments, disappointments, betrayals, and old wounds taking flight into the air with each of the delicate florets that float away. The weight of the old hurts is gone. 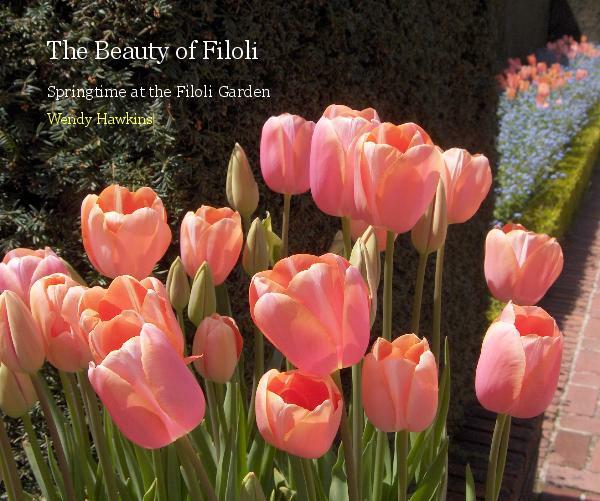 Releasing the florets is letting go – setting those emotional pains free. I blessed them as they scatter in the wind, sending forgiveness out with them. Forgiveness for the people who hurt me and forgiveness for myself for prolonging the pain as I held onto the old hurts. It felt very powerful, freeing and healing to create this mandala. Anytime I catch myself holding onto anger or a hurt, I will visualize the helpful dandelion and just let it all go. What old hurts are you carrying around? What hurts are you ready to let go of? Imagine how much lighter and freer you would feel to let go/ release/ forgive. At some point in our lives, we each face that moment of a heart-breaking, life-changing loss. I made it nearly 48 years before facing that kind of loss. Last year, my life was flipped upside down with the sudden and expected loss of my mother. It felt like a bad dream for the first several months. She was the center of our family. She was the foundation we all came from. How could she be gone? It also felt like time and ‘normal’ life stopped. I had trouble focusing and making decisions. I came to realize the grieving process is a cycle of spirals and each persons goes through it in their own, unique way and in their own time. Never let anyone tell you how you should be grieving or when it is time to stop grieving. Personally, I am not a crier. Tears do not flow easily for me. That does not mean I am not feeling the deep grief any less. I just process the grief in a different way. I let it out through my art and by writing in my journal. Slowly, the reality of the deep loss set in and I felt myself coming out of this frozen state. The undone mundane tasks of daily living were piling up and I felt it was time to move forward and catch up on them. My mom would have wanted us to keep moving forward. She would have wanted us to not miss out on opportunities. I traveled and enjoyed time with friends and family. I was blessed to be able to visit with my mom’s side of the family, who I had not seen for over a decade. To kick-off the new year, I painted this mandala. The word ‘console’ kept coming to me as I moved through the latter part of 2015. How do I console my sadness during the first holiday season without my mom? A big part of me wanted to fast-forward right through the holidays and pretend they weren’t happening. There was a heavy weight of dread on my shoulders. The other part of me wanted to honor her in some way for each holiday. How do I lift that weight of dread? I was looking for ways to console myself, to soothe and comfort myself. This Console mandala has three teardrops for the sadness and loss; a heart in the center for love; and big angel wings to wrap around me, like a warm blanket of comforting. The word ‘console’ was colored in a shimmery blue that sparkles in the light, like little stars in the sky. Sorry, this scanned image does not adequately capture the sparkle. I like to think of my mom’s spirit in the heavens watching over us and beaming love down to us. I hope she knows how much she is loved and missed every day. If you have journeyed with a loss this past year, I send consoling hugs and prayers to you. Ahhh. It is that time of year when I start getting the urge to purge; the itch to clear out the old; the desire to open up the house and let the fresh air blow out the musty, recycled air. I always feel so much better and lighter and freer when I clear out the clutter of my life. Spring is that time for renewal and rebirth. In order to make space for the new, we must clear out the old. We must release things that no longer serve us. We must let go of those things that hold us back – physically and emotionally. Physical clutter clearing is the easiest for me. I pick a room, closet, cabinet, shelf, etc. and just start to go through the items asking what do I still use and what have I not used in over a year. Clearing out those items I have not used will open up space, but sometimes there is an emotional attachment to an item. I feel a resistance to let it go. I want to keep it. Even if it is hidden at the bottom of a drawer where I rarely see it, there is comfort in knowing it is there. Most times, the item triggers a good memory for me. I like the feeling I get when I remember that good memory. I must remind myself that if I let go and release the item, the memory is still with me. Emotional clutter occurs when we hold onto old beliefs, old angers, old fears, old betrayals, old sadness. We may have regret for something we did in the past. We may wish we had chosen a different path or had been more open to opportunities that came to us. All of those kinds of stored up emotions keep us weighted down. They do not serve us to carry them around on our backs every day. What happened in the past, happened. It cannot be undone. We can examine the past and learn from those experiences, but then it is time to let go and work on releasing the emotional clutter. Be gentle with yourself as you do the work. The pay-off in the end is well worth it when we are free from the emotional baggage we carried. Back in November, I created the above mandala. I asked myself the question, “what do I need to release today?” After I finished painting it, the title ‘Release the muck” came to me. The brown muck in the center of the circle represents the emotional clutter that is ready to release. The message of the mandala is that it is time for me to examine the thoughts and beliefs and relationships that no longer serve me. After pondering this message for a while and digging through my emotional closet, I decided to address some of the toxic relationships in my life. I tend to be a very optimistic and giving person. I have many, many friends who are the same in that regard. There is balance in our relationship with giving and receiving and uplifting one another. And then there are those friends who seem to only reach out to me when they want something from me. They tend to create a lot of drama in their lives and then dump that drama at my door over and over again. That drama is not mine and it creates a negative energy in my life. It drains me to help again and again and again. This presented a good opportunity for me to strengthen my boundaries and work on saying ‘no’ to those toxic relationships. I am worthy of healthy relationships and my time and energy are valuable. My mandala shows the bright, colorful energy that is ready to come into my life when I clear out the muck. The positive energy flows and swirls all around me. What will you find when you dig through your emotional closet to clear the clutter? What muck needs to be released from your life? Happy Spring Cleaning to you!! Welcome to 2014! A new year and a time to start fresh. I am not one for making new year’s resolutions. Gave that up a long time ago. I prefer to set intentions for the year. Intentions are not measurable goals, but more of a mind-set. Intentions set the atmosphere in which I live and breathe each day. For 2014 I set several intentions. Self-care is the one I am focusing on today. When I think of self-care, I think of slowing down from the whirl-wind of modern life to take care of my needs. It is taking the time to nurture myself and making sure that I am replenishing the vital energy I need to make it through each day. Many times, that basically comes down to loving myself enough to do things that feed my soul. Loving ourselves is not always easy. Each of us is the only person who sees ALL of our personal demons and weaknesses and hears the running voice that beats us down for mistakes we make. What if, instead of listening to that voice, we shower ourselves in unconditional love each day? What if we each plant a seed of unconditional self-love in our heart and let it blossom? What if we planted many seeds? 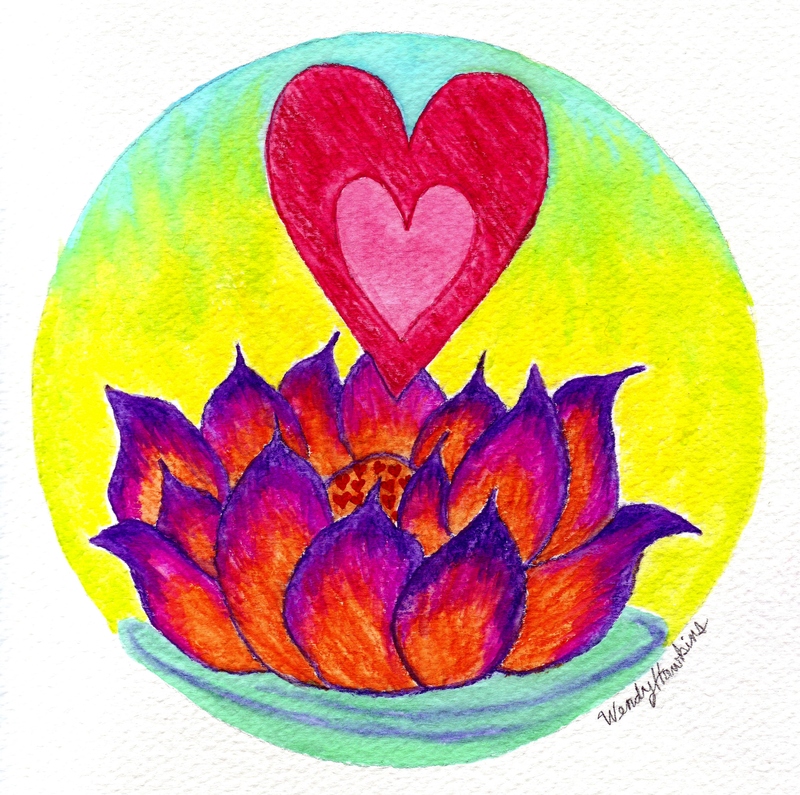 The mandala I have chosen for this self-care topic is called Lotus Love. It was painted for a friend who asked for a mandala representing unconditional love that she could give to her husband for their 10th wedding anniversary. Lotus flowers are sacred and often represent enlightenment and beauty. They symbolize the timeless and continual process of birth and rebirth. At night, the lotus flower sleeps. At sunrise, with the waking of the sun, the lotus flower emerges to life. Little heart seeds grow in the center of the lotus of my mandala. The lotus flower’s opening petals symbolize the potential for the soul to expand and blossom. In this mandala, a love that continually grows deeper is blossoming. Imagine applying this deepening love to ourselves each day. We can renew that love and self-care for ourselves each morning as we awake. For me, self-care takes many forms. It is taking time to get quiet and still to meditate. It is making time to paint and create art. It is reading that book I have been dying to read. It is taking naps in the middle of the day. It is not booking up my schedule every moment of every day. It is leaving free time to sit in nature and day-dream. It is propping up my feet and enjoying a good movie at home. It is treating myself to time with friends and family. It is learning to say ‘No’ when asked to do something I do not have the time/energy for nor the desire to spend my energy that way. It is saying ‘Yes’ to myself for those whims of sleeping in really late or going to explore someplace new. These are just a few of the key ways I take care of myself. I’m sure that as I apply the self-care intention throughout the year, I will discover all sorts of new ways to promote self-care in my life. What does self-care mean for you? What does it look like in your day? Do you feel selfish or guilty when you take time to care for your personal needs? My wish is that you take time each day to do something that nourishes your soul and replenishes your energy. I am blessed to be part of an amazing online support group for women with Rheumatoid Arthritis. We have adopted as our symbol, the beautiful dragonfly. Dragonflies look to be very fragile, but they have 20 times as much power in each of their wing strokes when compared to other insects. They have the ability to move in all six different directions and can fly up to 45 miles per hour. Their eyes are impressive as they can see in all 360 degrees around themselves. Dragonflies live most of their lives in the nymph stage and only fly for a few months in their adult stage. Their short life reminds us to live in the moment and live life to its fullest with what we have. The symbolism of the dragonfly is inspiring to our support group. Dragonflies symbolize change and change in the perspective of self-realization, especially understanding the deeper meaning of life. The dragonfly’s scurrying flight across water represents an act of going beyond what is on the surface and looking into the deeper implications and aspects of life. Dragonflies exhibit iridescence on both their wings and bodies. The magical property of iridescence is also associated with the discovery of one’s own abilities by taking off the masks we wear and removing the doubts one casts on his/her own sense of worth. They also remind us to be aware of and grateful for our inner and outer beauty. The women in my RA support group are the strongest women I know. Some of them (myself included) may look fragile, but we are powerful when it comes to living with chronic pain and fatigue and stress. Some days the pain knocks us down, but then we get up again the next day and do what needs to be done. We juggle family, work, schooling, along with our disease management. We face the change that comes with an auto-immune diagnosis: change in our bodies; change in what we can and cannot do; and change in our priorities. We reach out and support one another through the tough times and the triumphs. I consider them all to be my sisters! Over the past weekend, we attended our national Arthritis Introspective conference for people with all forms of auto-immune diseases. It is the one time of year that we get to be face-to-face with each other. I cannot tell you how thrilling it is to hug these sisters of mine and laugh and cry with them in person. We feel ‘normal’ when we are all together. I can say only a few words about my daily experiences with Rheumatoid Arthritis and they all GET IT!! They KNOW what 98% of the other people I encounter in my life DO NOT know about living with these diseases. We can relax and know that we are accepted and honored by each other. As a kid growing up with Juvenile Rheumatoid Arthritis (JRA), I did not know anyone my own age who battled this awful disease. I always felt so alone in dealing with it. I was diagnosed with JRA at only 18 months old. It is all that I have ever known. My childhood experience was different than the experiences of my classmates. Having a chronic illness forced me to face things that other children don’t have to deal with. One thing I am deeply grateful for is that I had caring classmates from kindergarten through 8th grade. They never made fun of me or treated me as an outcast. I appreciate the gift that they gave me with that acceptance. I did not meet anyone my own age with JRA until I was 26 yrs old. I was so excited because suddenly I was not alone in this battle. I wanted to hold tight to this girl and ask a million questions about her experience with JRA. There was such power in that connection. And as I met other folks with JRA, it was like this hole in me was starting to be filled for the first time in my life. I know that all of my brothers and sisters, who live the journey with these auto-immune diseases, have their own stories. We are all powerful when we come together to share our stories. Let us all remember the small but mighty dragonfly who teaches us to grow with the change in our lives and to live life to the fullest, no matter what is thrown our way. As one year comes to an end, another new year begins. Our annual ritual of making resolutions causes us to reflect on our lives and see where we might make some tweaks to live healthier and happier. I personally do not like the word resolution so I prefer to meditate on my intentions for the new year. On January 3rd in 2000, I sat down to paint a mandala and asked myself “what does this new year have in store for me?” The mandala answer that came out was four-fold: the new year would have celebration, growth, release (let go), and love. This answer is timeless. May your New Year be full of celebration for the big things and the little things. It is wonderful to celebrate the big milestones that we cross each year. It is also uplifting to celebrate the little things that bring a smile to our face or warmth to our heart as we make it through each day. Gratitude comes into play here. We are rich with reasons to celebrate and feel blessed each day. Look for those opportunities to celebrate. For someone like me with a debilitating disease like Rheumatoid Arthritis, just getting out of bed on a bad flare day can be a reason to celebrate! May your New Year be full of growth. May those things your pour your time and energy into, sprout with lasting growth and new opportunities. May you invest in personal growth and see your life light up in new ways. May your personal growth journey open doors to more happiness and more fulfillment. May your New Year be full of releasing those things or people that hold you back from your goals. Letting go of toxic relationships is difficult, yet must be done in some instances to allow yourself to blossom into who you are meant to be. Letting go of anger or hurt or sadness or betrayal is a challenge. The only way to move forward is to release it, to surrender it, to let it GO! Offer it up and move on to more joyful things. May your New Year be full of love. Yes, all forms of LOVE!! The mushy-gushy love. The familial love. The friendship love. The love of the planet. The love of doing the right thing and giving back to your community. And most importantly, the love you feel for yourself! Self-love should never be left off the list. Love yourself and all your quirky flaws. Love your imperfections and be gentle with yourself. Life gets messy and in the end the person who never leaves you is yourself. Love yourself through whatever life throws at you! I wish these things for all of you! May you all be blessed with an abundance of celebration, growth, release, and love! As a way to invite more abundance into my life, my creative project to ring in the New Year this year is an Abundance jar. I decorated this jar and bought a cube of multi-colored note paper. Every time something good happens in 2013, I will write about it and put the paper in my Abundance jar. Next New Year’s Eve, I will open the jar and read about all the amazing things that happened for me. It would be fun to have all my friends and your friends do the same and then get together at the end of next year and share all the good things that occurred. What a gift to be reminded of ALL the good things we are blessed with over the course of the year! !